CHOUPICOS BEGINNER READER SERIES: She is a cat. He is a mouse. They are best friends: they play, they fight, they make up, they laugh, they cry... These are their stories. Mousimus wants to play with a ball. Kitty Cat wants to read. So he has to ask... nicely. But there is one more thing missing: Princess Super Kitty Cat's tiara! And it is really missing! Who took it?! And why?! In a simple, comic book style andÂ one panel per page, this beginner book series will entertain your budding reader with friendship stories between a cat and a mouse. 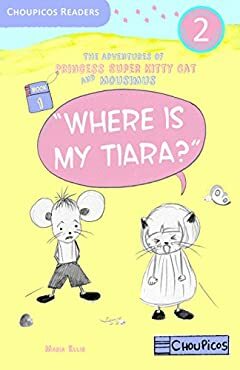 These are the adventures of a not-so-typical princess cat and her best friend, a daring and fun mouse boy.